Although I call this a puzzle, it doesn't really qualify as a puzzle. It is in fact an education aid to assist with the teaching of letter and word recognition skills to young students. It consists of a fragment of text printed above a maze of letters, and within this maze the text can be found starting at the top left of the maze, and ending at the bottom right. Between these two points, the text meanders randomly throughout the maze. The task of the student is to trace the path of the text by drawing a circle around each successive letter of the text. The following graphics shows a Find-A-Quote puzzle which has just been constructed in the Crossword Express Build screen. Note that the solution to the puzzle can be identified by the shaded background of those cells which contain the quote. 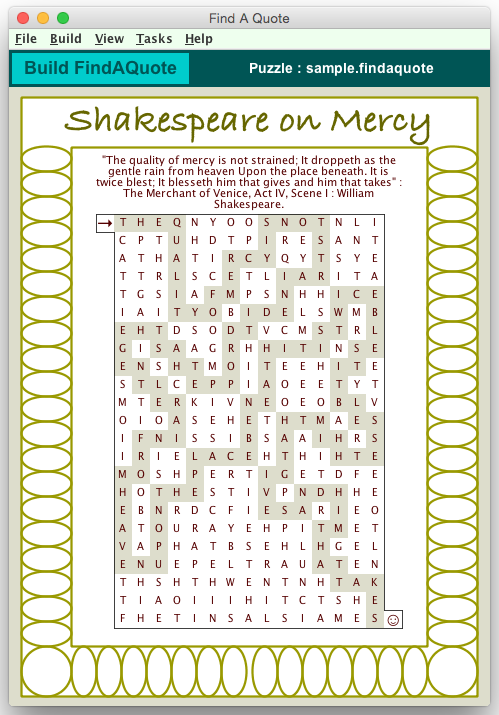 See also a full size version of a PDF file showing the puzzle as it would appear when printed. Fully automatic construction of the puzzles. Simply type in the required quote using the Build/Build Options function, and then select the Build/Start Building function to build the puzzle..
Formatted output can also be exported from the Print screen to graphic files which conform to the BMP, GIF, JPG or PNG formats, or you can export to the system clipboard and then paste into any WP or DTP application. Naturally, color settings can also be applied in these cases.